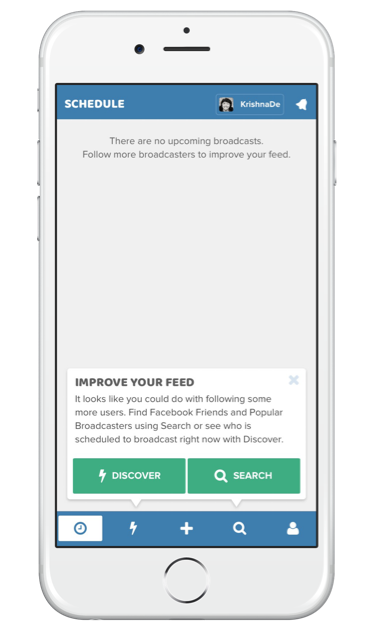 If you are live streaming, you will know that one of the challenges is attracting viewers to your shows. Many live streamers enjoyed using previously available live stream platforms where they could be discovered because people were using the platform and could come across their live stream. 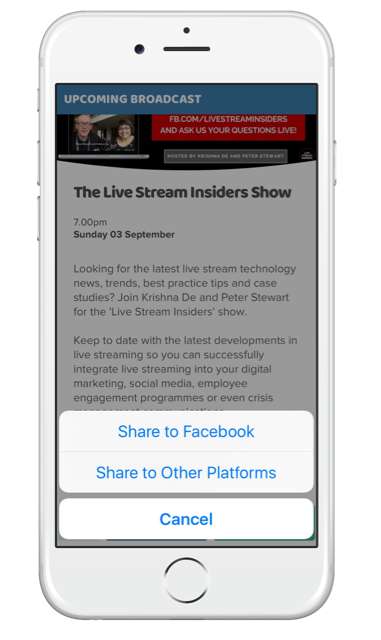 That is one of the issues the new Facebook Watch programme is meant to help with and you will also have noticed that if you watch live streams on desktop on Facebook you will see other live streams that are taking place at the same time. But not everyone is live streaming using Facebook Live. That is where the new platform Stream Time plays a part. I discovered the app on Product Hunt and below you will see a tutorial on how to use the platform. I also reached out to the developers to learn more about the app which I hope you will find of interest. The team behind Stream Time are Trevor Evans and Joel Freeborn who met when working at a mobile development agency in the heart of ‘Tech City’ Shoreditch, London. Over the course of three years, they provided digital solutions for the likes of Aston Martin, NHS and Publicitas (now Newbase). I was interested in what inspired them to create the app. Trevor told me he is a big Tranmere Rovers football team fan. The club regularly live stream but he found the ‘Live Now’ notification from Facebook, Mixlr and Periscope was inconvenient, as he was either driving at the time or out shopping so would miss the live streams. Trevor found that he wasn’t alone in this frustration, and that the most common way live content creators were (if at all) informing their followers and fans that they were due to go live was via a status update or a Tweet which was getting lost in the depths of news feeds. In late 2016, they applied for the Next Media Accelerator (NMA) in Hamburg with only a basic pitch deck and a prototype for the platform – they were successful in getting initial investment which has allowed them to build the Stream Time iOS app, web app and website widgets. I was intrigued about their own background in live streaming and they told me that they have been observing the progress of live streaming (especially in social) over the past 18 months. They have recently begun creating live content themselves about their own journey and learnings in developing Stream Time, and they plan grow the live streams into more of a resource in the months ahead. Stream Time is available as an iOS app. That is how you go about creating an account. If you do not have access to an iOS device,you can contact the team and they will create an account for you. 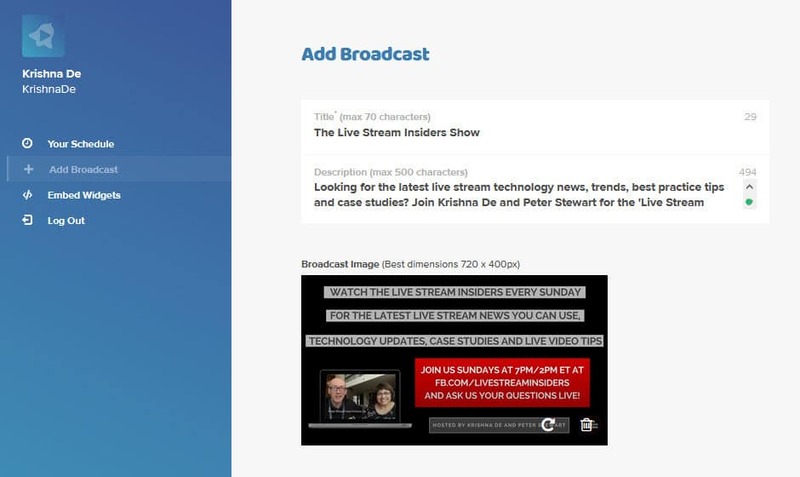 Then you can use the web app to manage your live stream schedule. In my tutorial below you will discover how to use the iOS app and the desktop platform. The team decided to lead with iOS and plan to develop and release on Android as soon as they secure our next round of investment. I noticed that there was a feature called ‘Verified Shows’. The team tells me that a verified user is a content creator that they can see is active, or a content creator that they have identified as a known brand. 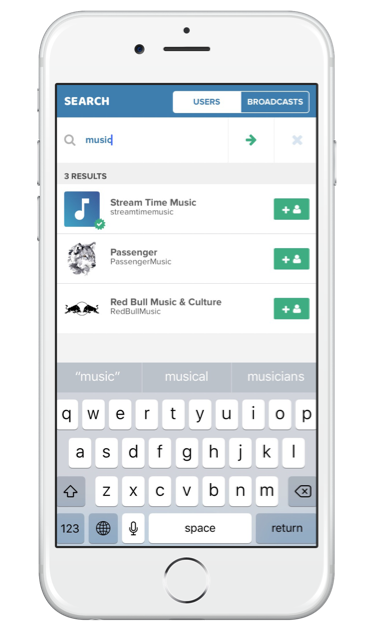 The account is then verified by Stream Time which gives them priority in search and listing results. If you create an account on Stream Time and meet the criteria for verification they will review your account and then arrange to verifiy it. The other thing you will notice on the iOS app is that some shows are featured. A Featured broadcast is something that Stream Time feel could be interesting to most of their users. Broadcasters can either bring a show to their attention to get featured and they are constantly scanning the newly scheduled broadcasts to find interesting broadcasts to set as Featured. Stream Time want to become ‘the go to place’ for live content and want broadcasters to think of Stream Time as the place they can find an engaged audience for their live content. 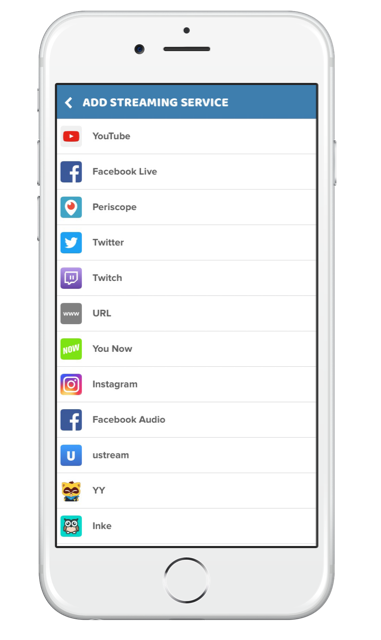 They also want viewers to be able to find the most interesting live content from across the internet and live streaming platforms. Trevor comented to me that as this space grows, the number of streaming platform services is increasing – and the race for live content rights is hotting up, which will make it harder for users to find live content, and for broadcasters to find an engaged audience. The app is free at the moment and I was interested to learn how they plan to monetise. Content creators will be able to charge a viewing fee to their fans, similar to pay-per-view (PPV) like sporting events. They will be working with feedback from content creators and users on the best way to implement this. The team plan to build an API once they get investment to enable the auto scheduling in the app from live stream platforms that enable scheduling. They alos plan to allow users to sign in with multiple social media accounts (such as Google, Twitter, Twitch, etc) pulling in their account information, then users can be informed if there are already content creators on Stream Time that they are subscribed to for example on YouTube who they can then choose to follow in Stream Time. Going back to the original inspiration for Stream Time, I noticed an article on the Stream Time blog that outlined that they had been working with Tranmere Rovers – they comment that previously the promotion of live streams had been through the Facebook page for the club. In May 2017, in the run up to their playoff final game at Wembley, Tranmere used Stream Time to schedule their live content. 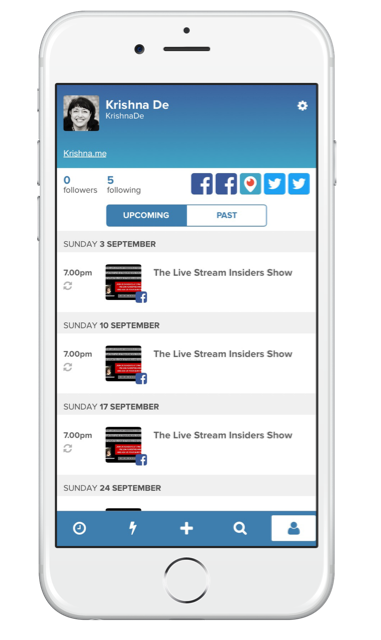 Their upcoming broadcasts were added to the Stream Time app with titles, imagery and descriptions as well as the all important time, date and streaming platform. 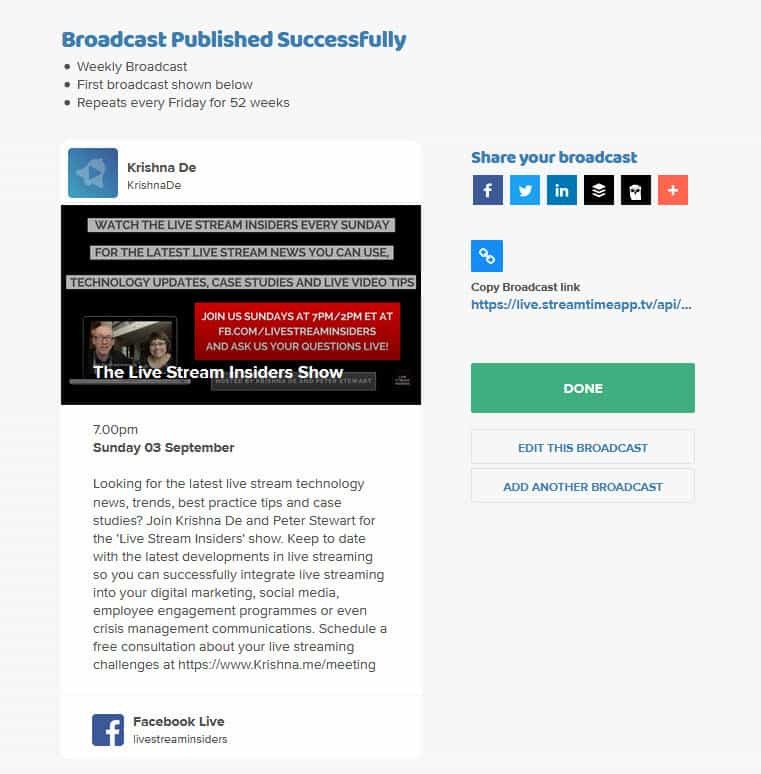 In addition to posting out Stream Time links via social media, they also embedded the free Stream Time widget into their website displaying their live stream schedule. This helped them increase the number of viewers engaged in the live streams from 1,478k per broadcast to 1,844k per broadcast. 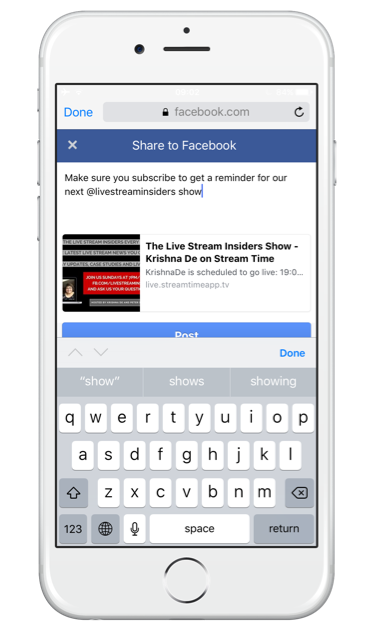 Unless you are using specific live stream tools such as BeLive.tv, you can not add a link on Facebook to pre-schedule a show on your Page or Profile. 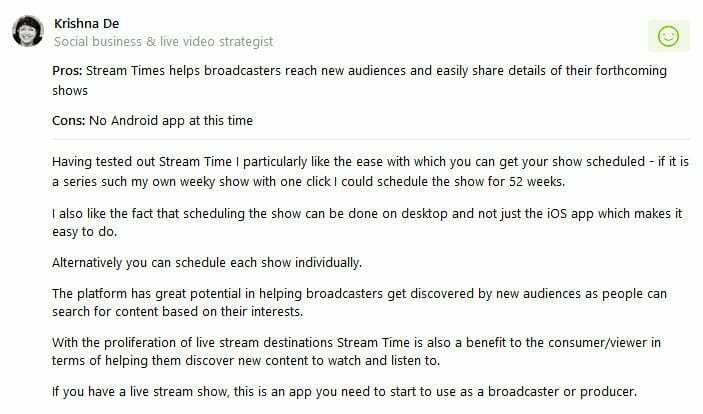 This is also the same for Periscope live streams, though you can pre-schedule shows on YouTube easily. Using Stream Time, someone can subscribe to your live streams and they will then get a notifications when you schedule a broadcast. They can then plan to watch your broadcast setting a reminder to watch. 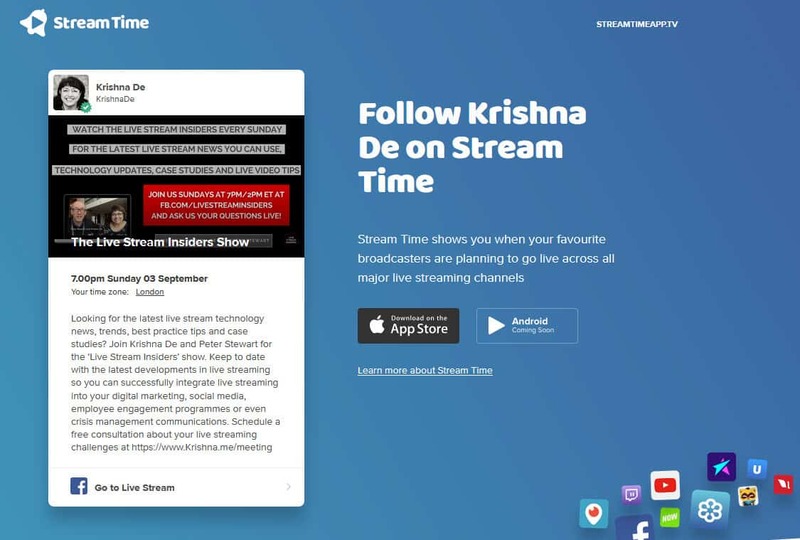 Below you will see a walk through of how to use Stream Time to discover live streams to watch and also how to use the app as a broadcaster to publish and promote your own live shows. 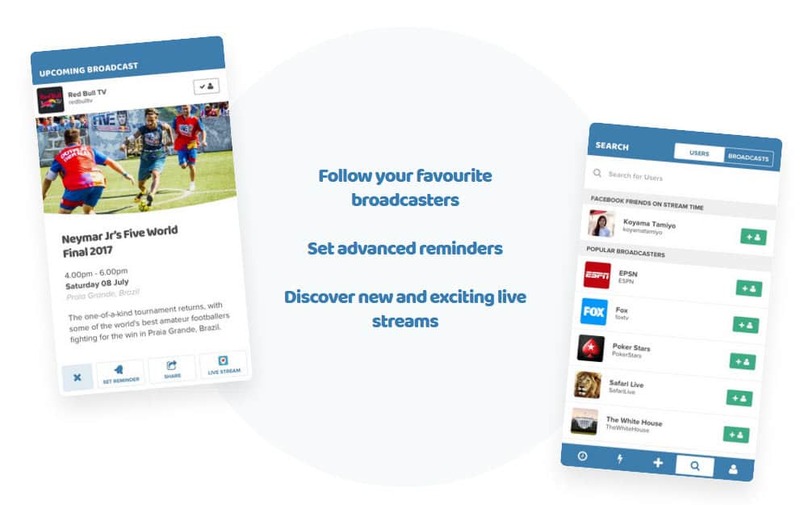 Let’s imagine you want to discover interesting live streams to watch – the Stream Time app enables you to follow broadcasters your are interested in and set reminders for forthcoming live events so you do not miss them. The first thing you will need to do is register as a user – this has to be done on the iOS app. You can then add the topics you are interested in following by entering your interests. You can find broadcasters to follow by seeing who is scheduled to broadcast now or search by keyword. 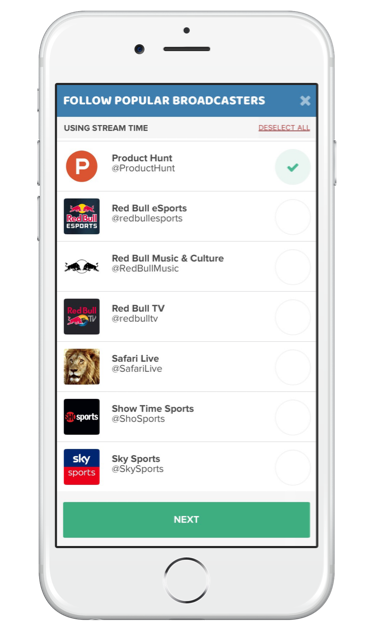 When you find a broadcaster your are interested in, you can follow their account so you will be able to get notifications of their future live streams. 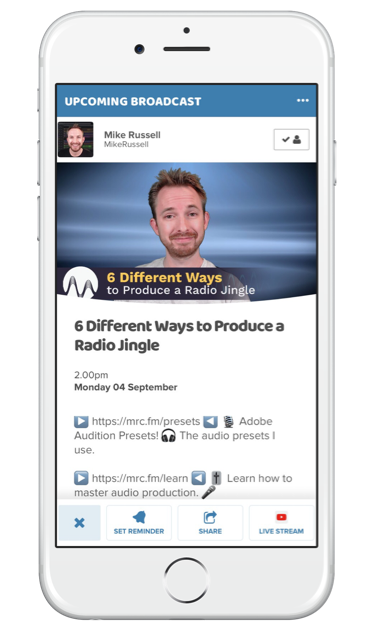 I discovered my friend Mike on the app – he schedules his live streams on YouTube and the Stream Time team discovered him so they are using the YouTube API to add his forthcoming live streams to the app. When I check the details for a specific show I can set a reiminder to get a notification when he is live, I can share his live stream to my network and I can also directly open his YouTube channel where he is streaming from. In your settings for your profile you can determine how far in advance (up to 60 minutes) you want to get a notification for a live stream that is due to start. 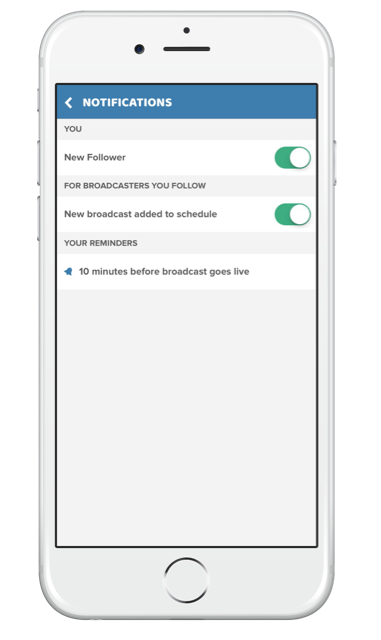 You can also turn on notifications for new broadcasts that are added for broadcasters you follow so you do not need to miss a future live stream they broadcast. If you are a broadcaster it is easy to add your own shows – firstly in your profile settings you need to add the streaming services you use. Only five services will show up on your profile so you can re-arrange the order by moving them up and down the list to make sure the streaming services or links you want to prioritise show on your profile. When you schedule your broadcast you can choose the specific streaming service you will be using. You can check that your link to the streaming service is correct then add it to your profile. 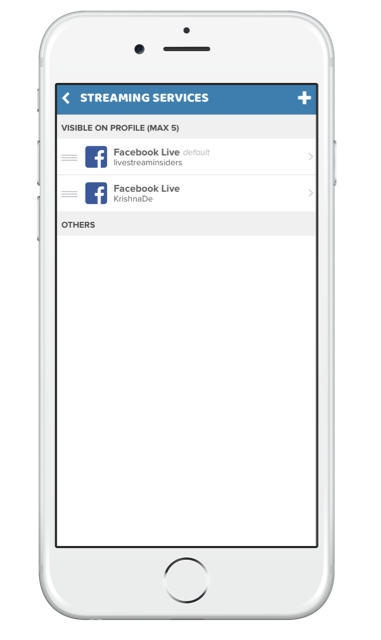 What I liked about the app when setting it up is that you can add multiple sites per service – as an example I would add my own Facebook profile, my Facebook page and the Facebook page for the Live Stream Insiders show which is great as a I use all three locations for streaming. 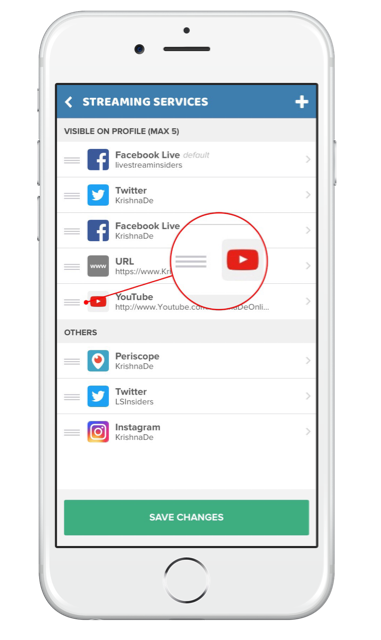 Once you have set up your streaming service you can add your broadcasts in the app. 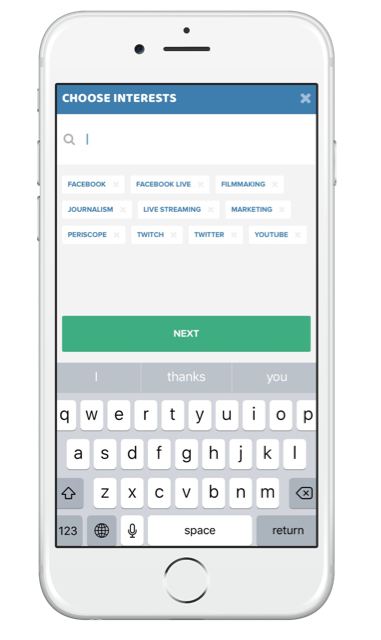 You will be able to add a description of up to 500 characters and you can type any words as tags that will help you be discovered by users. 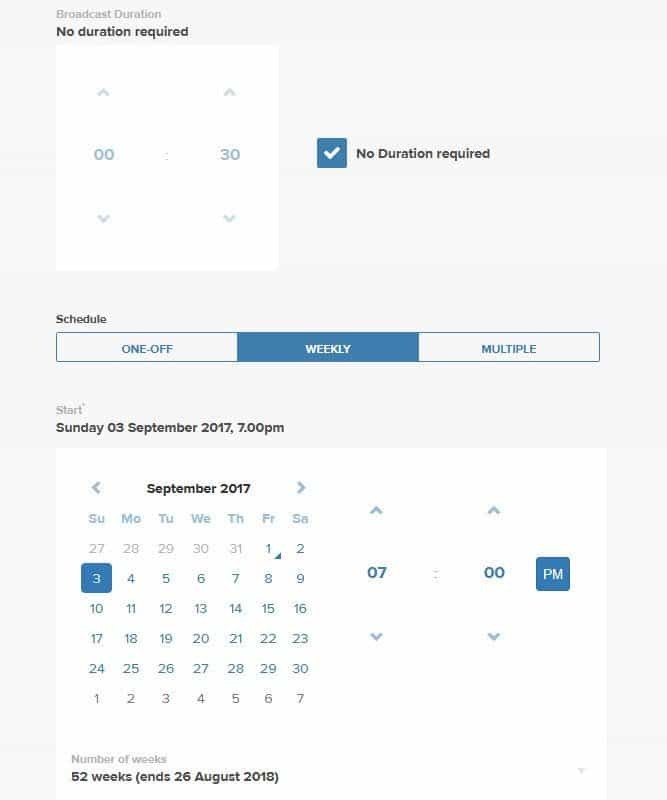 If you prefer, you can schedule the live streams on desktop – just log into the web app to begin to schedule your streams. You will see a prompt to add a cover image for your show – the image needs to be 720 pixels by 400 pixels. You can add the date of your live stream, a duration for the show and what was really helpful for my weekly show was that I could add them to the Stream Time app for the next year. 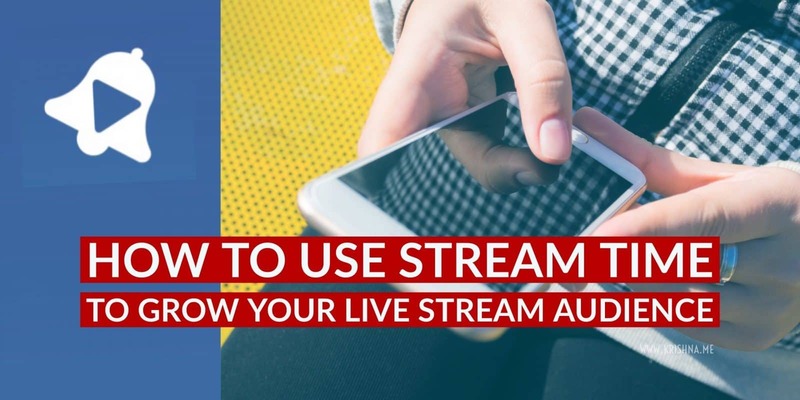 Once you have published the live stream in the scheduling tool, you can then easily edit it and share your broadcast – you can also copy the link to the broadcast which can be used on the web so you could add this to any online communications to help you market and promote your live stream. You can also do the same in the iOS app. Unfortunately at this time, you cannot edit past events at the moment if you want to add show notes or further information once a show has ended as I always do to my live streams – such as editing the post on Facebook for each broadcast when the event has ended. 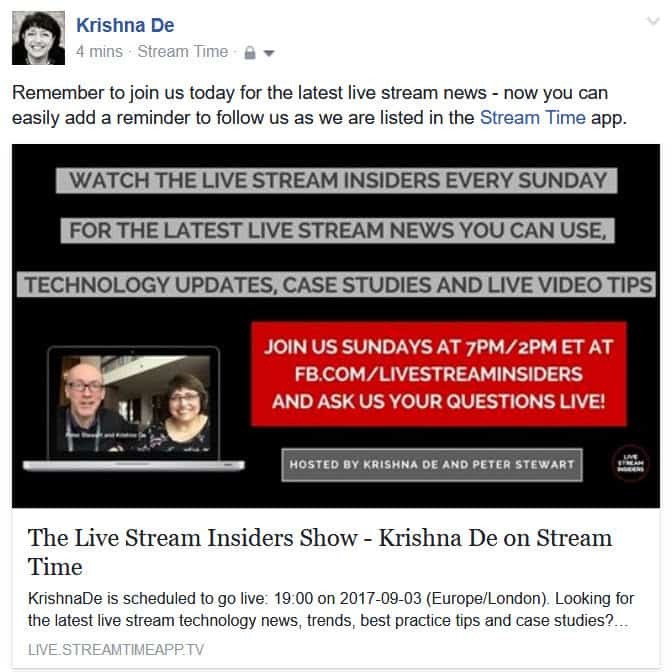 Sharing your forthcoming live stream to social media channels is easy using the Stream Time app. At the time of posting this tutorial, I could not see a way to share to a page or a group or event – you can share to your personal profile – you would need to copy the link to share to your other locations on Facebook. This is how the post when shared to Facebook will appear. 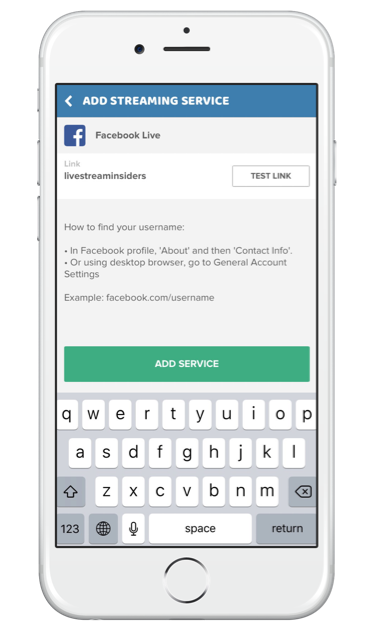 When someone clicks the link in the post on Facebook or other platform them will then be taken to a landing page for your live stream and a prompt to download the iOS app – if they click on the link on their phone and already have the iOS app installed they will get a prompt to open in the app and then they can subscribe to follow you and get notifications for your forthcoming stream. Another feature that you may want to make use of is that you can access an embeddable widget to add to your website which means that all your forthcoming shows will be able to be seen. 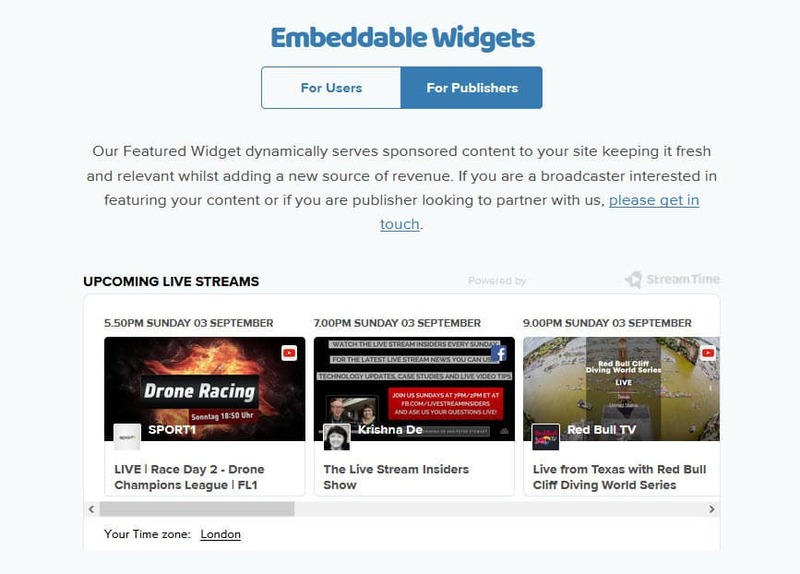 You can create a widget for a single live stream broadcaster or for multiple featured publishers. 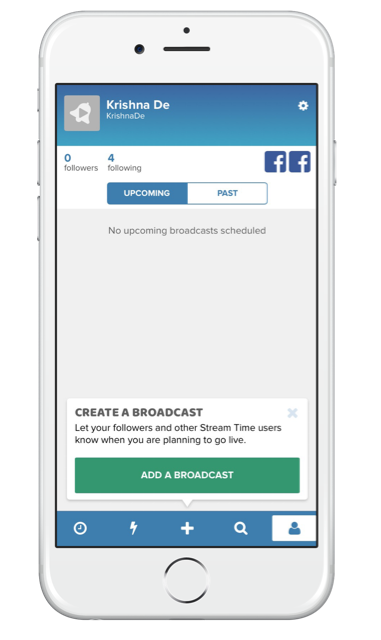 I hope you find this a helpful walk through of the Stream Time app and that you might consider using it for your own live stream broadcasts to help you promote your shows and attract more viewers. If you do join the platform remember to subscribe to my channel if you are interested in my streams about social business tools, live streaming and mobile marketing. If you want to see a short video about the app you can view it here on YouTube or watch it below. 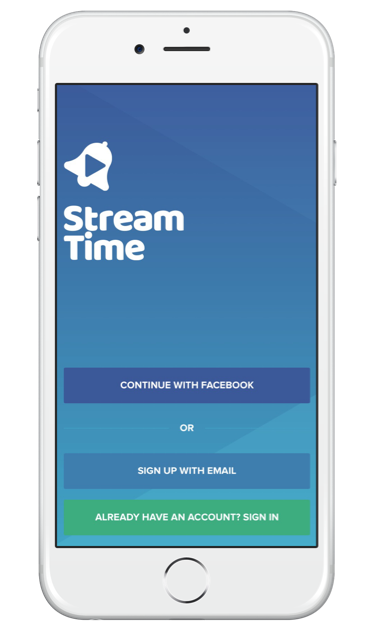 Let me know if you plan to use Stream Time app – and if you have questions about using live streaming in your communications and marketing, you can schedule a private consultation with me – I am only too happy to answer your questions.